Hi there! Today I present you the study of an asteroid pair. Not a binary, a pair. A binary asteroid is a couple of asteroids which are gravitationally bound, while in pair, the asteroids are just neighbors, they do not live together… but have. The study is entitled Detailed analysis of the asteroid pair (6070) Rheinland and (54287) 2001 NQ8, by Vokrouhlický et al., and it has recently been published in The Astronomical Journal. I have presented asteroid families in a previous post. These are groups of asteroids which present common dynamical and physical properties. They can be in particular identified from the clustering of their proper elements, i.e. you express their orbital elements (semimajor axis, eccentricity, inclination, pericentre, …), you treat them properly so as to get rid off the gravitational disturbance of the planets, and you see that some of these bodies tend to group. This suggests that they constitute a collisional family, i.e. they were a unique body in the past, which has been destroyed by collisions. An asteroid pair is something slightly different, since these are two bodies which present dynamical similarities in their osculating elements, i.e. before denoising them from the gravitational attraction of the planets. Of course, they would present similarities in their proper elements as well, but the fact that similarities can be detected in the osculating elements means that they are even closer than a family, i.e. the separation occurred later. Families younger than 1 Myr (1 million of years) are considered to be very young; the pair I present you today is much younger than that. How much? You have to read me before. A pair suggests that only two bodies are involved. This suggests a non-collisional origin, more particularly an asteroid fission. Imagine an asteroid with a very fast rotation. A rotation so fast that it would split the asteroid. We would then have two components, which would be gravitationally bound, and evolving… Depending on the energy involved, it could remain a stable binary asteroid, a secondary fission might occur, the two or three components may migrate away from each other… and in that case we would pair asteroid with very close elements of their heliocentric orbits. It is thought that the YORP (Yarkovsky – O’Keefe – Radzievskii – Paddack) could trigger this rotational fission. This is a thermic effect which alter the rotation, and in some cases, in particular when the satellite has an irregular shape, it could accelerate it. Until fission. Thermic effects are particularly efficient when the Sun is close, which means that NEA (Near Earth Asteroids) are more likely to be destroyed by this process than Main Belt asteroids. Here, we deal with Main Belt asteroids. The following table present properties of Rheinland and 2001 NQ8. The orbital elements are at Epoch 2458000.5, i.e. September 4th 2017. They come from the JPL Small-Body Database Browser. Beside their magnitudes, i.e. Rheinland is much brighter than 2001 NQ8, this is why it was discovered 10 years earlier, we can see that all the slow orbital elements (i.e. all of them, except the longitude) are very close, which strongly suggests they shared the same orbit. Not only their orbits have the same shape, but they also have the same orientation. A useful tool for determining the rotation and shape of an asteroid is the lightcurve. The object reflects the incident Solar light, and the way it reflects it will tell us something on its location, its shape, and its orientation. You can imagine that the surfaces of these bodies are not exclusively composed of smooth terrain, and irregularities (impact basins, mountains,…) will result in a different Solar flux, which also depends on the phase, i.e. the angle between the normale of the surface and the asteroid – Sun direction… i.e. depends whether you see the Sun at the zenith or close to the horizon. This is why recording the light from the asteroid at different dates tell us something. 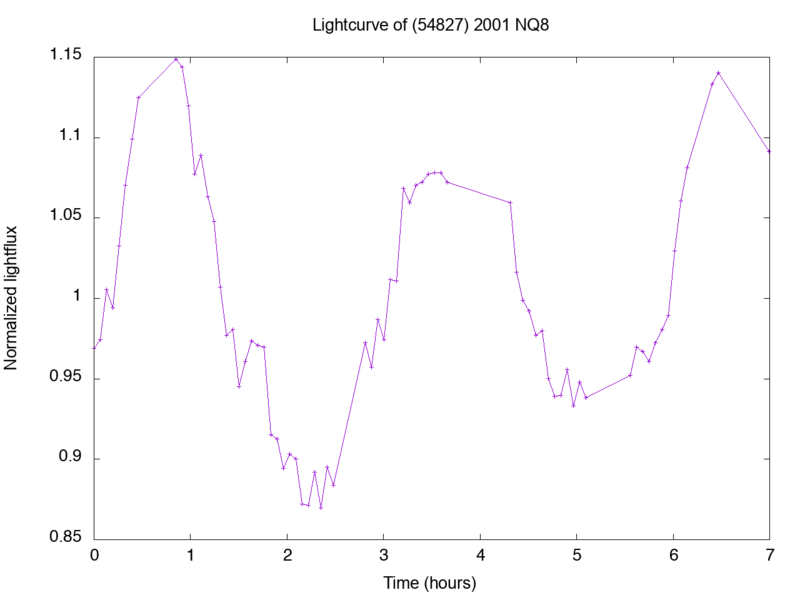 You can see below an example of lightcurve for 2001 NQ8. Example of lightcurve for 2001 NQ8, observed by Vokrouhlický et al. Recording such a lightcurve is not an easy task, since the photometric measurements should be denoised, otherwise you cannot compare them and interpret the lightcurve. 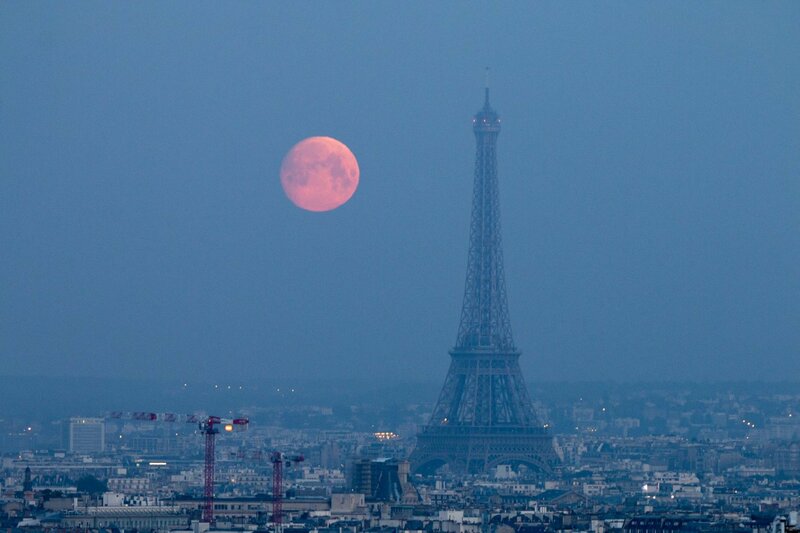 You have to compensate for the variations of the luminosity of the sky during the observation (how far is the Moon? ), of the thickness of the atmosphere (are we close to the horizon? ), of the heterogeneity of the CCD sensors (you can compensate that in measuring the response of a uniform surface). And the weather should be good enough. are retrograde, with respect to their orbital motions. Moreover, two solutions best match the pole of 2001 NQ8. The other aspect of this study is a numerical simulation of the orbital motion of these two objects, backward in time, to date their separation. Actually, the authors considered 5,000 clones of each of the two objects, to make their results statistically relevant. They not only considered the gravitational interactions with other objects of the Solar System, but also the Yarkovsky effect, i.e. a thermal pull due to the Sun, which depends on the reflectivity of the asteroids, and favors their separation. For that, they propose new equations implementing this effect. They also simulated the variations of the spin pole orientation, since it affects the thermal acceleration. And here is the result: the fission probably occurred 16,340 ± 40 years ago. Discovery of a third member? close approach, some 16,000 years from now, could have not been the right one, and that the fission could have been much older. For that, they ran long-term simulations, which suggest that older close approaches should have been less close: if the pair were older, Yarkovsky would have separated it more. Hi there! Do you remember Chariklo? You know, this asteroid with rings (see this post on their formation). Today, we will not speak on the formation of the rings, but of the asteroid itself. I present you the paper entitled The dynamical history of Chariklo and its rings, by J. Wood, J. Horner, T. Hinse and S. Marsden, which has recently been published in The Astronomical Journal. It deals with the dynamical stability of the asteroid Chariklo as a Centaur, i.e. when Chariklo became a Centaur, and for how long. Chariklo is a large asteroid orbiting between the orbits of Saturn and Uranus, i.e. it is a Centaur. 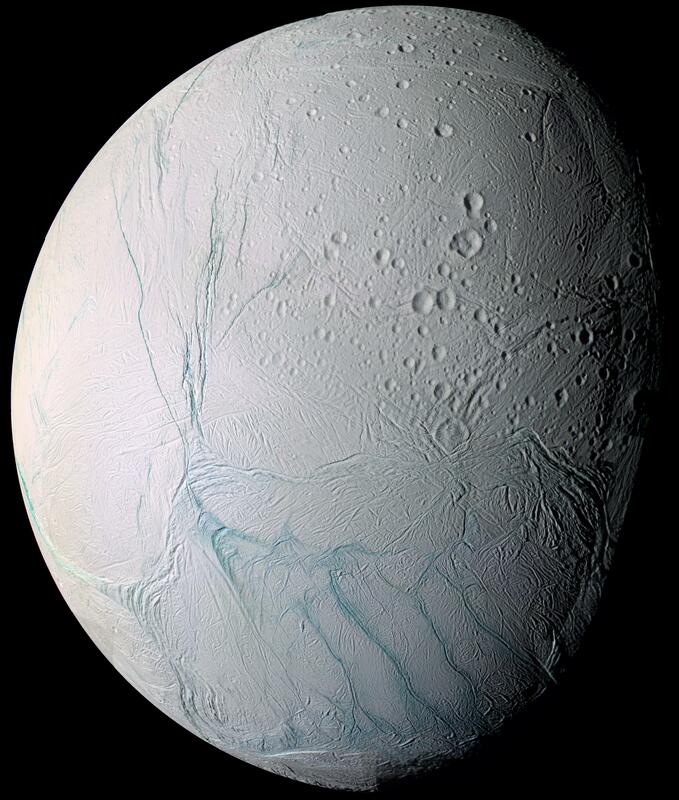 It is the largest known of them, with a diameter of ~250 km. It orbits the Sun on an elliptic orbit, with an eccentricity of 0.18, inducing variations of its distance to the Sun between 13.08 (perihelion) and 18.06 au (aphelion), au being the astronomical unit, close to 150 millions km. But the main reason why people are interested in Chariklo is the confirmed presence of rings around it, while the scientific community expected rings only around large planets. These rings were discovered during a stellar occultation, i.e. Chariklo occulting a distant star. From the multiple observations of this occultation in different locations of the Earth’s surface, 2 rings were detected, and announced in 2014. Since then, rings have been hinted around Chiron, which is the second largest one Centaur, but this detection is still doubtful. Anyway, Chariklo contributes to the popularity of the Centaurs, and this study is focused on it. the Oort cloud, which was theoretically predicted as a cloud of objects orbiting near the cosmological boundary of our Solar System. It may be a reservoir of comets, these small bodies with an eccentricity close to 1, which can sometimes visit our Earth. The Centaurs are interesting from a dynamical point of view, since their orbits are not that stable, i.e. it is estimated that they remain in the Centaur zone in about 10 Myr. Since this is very small compared to the age of our Solar System (some 4.5 Gyr), the fact that Centaurs are present mean that the remaining objects are not primordial, and that there is at least one mechanism feeding this Centaur zone. In other words, the Centaurs we observe were somewhere else before, and they will one day leave this zone, but some other guys will replace them. There are tools, indicators, helpful for studying and quantifying this (in)stability. Usually, an orbiting object is considered as “stable” (actually, we should say that its orbit is stable) if it orbits around its parent body for ever. Reasons for instability could be close encounters with other orbiting objects, these close encounters being likely to be favored by a high eccentricity, which could itself result from gravitational interactions with perturbing objects. To study the stability, it is common to study chaos instead. And to study chaos, it is common to actually study the dependency on initial conditions, i.e. the hyperbolicity. If you hold a broom vertically on your finger, it lies in a hyperbolic equilibrium, i.e. a small deviation will dramatically change the way it will fall… but trust me, it will fall anyway. And a good indicator of the hyperbolicity is the Lyapunov time, which is a timescale beyond which the trajectory is so much sensitive on the initial conditions that you cannot accurately predict it anymore. It will not necessarily become unstable: in some cases, known as stable chaos, you will have your orbit confined in a given zone, you do not know where it is in this zone. The Centaur zone has some kind of stable chaos (over a given timescale), which partly explains why some bodies are present there anyway. Fortunately, the MEGNO (Mean Exponential Growth of Nearby Orbits) indicator was invented, which converges much faster, and from which you can determine the Lyapunov time. If you are hyperbolic, the Lyapunov time is contained in the growth rate of the MEGNO, and if not, the MEGNO tends to 2, except for pretty simple systems (like the rotation of synchronous bodies), where it tends to zero. We have now indicators, which permit to quantify the instability of the orbits. As I said, these instabilities are usually physically due to close encounters with large bodies, especially Uranus for Centaurs. This requires to define the Hill and the Roche limits. First the Roche limit: where an extended body orbits too close to a massive object, the difference of attraction it feels between its different parts is stronger than its cohesion forces, and it explodes. As a consequence, satellites of giant planets survive only as rings below the Roche limit. And the outer boundary of Saturn’s rings is inner and very close to the Roche limit. Now the Hill limit: it is the limit beyond which you feel more the attraction of the body you meet than the parent star you both orbit. This may result in being trapped around the large object (a giant planet), or more probably a strong deviation of your orbit. You could then become hyperbolic, and be ejected from the Solar System. This study consists in backward numerical integrations of clones of Chariklo, i.e. you start with many fictitious particles (the authors had 35,937 of them) which do not interact with each others, but interact with the giant planets, and which are currently very close to the real Chariklo. Numerical integration over such a long timespan requires accurate numerical integrators, the authors used a symplectic one, i.e. which presents mathematical properties limiting the risk of divergence over long times. Why 1 Gyr? The mean timescale of survival (called here half-life, i.e. during which you lose half of your population) is estimated to be 10 Myr, so 1 Gyr is 100 half-lives. They simulated the orbits and also drew MEGNO maps, i.e. estimated the Lyapunov time with respect to the initial orbital elements of the particle. Not surprisingly, the lower the eccentricity, the more stable the orbit. And the result is: Chariklo is in a zone of pretty stable chaos. Moreover, it is probably a Centaur since less than 20 Myr, and was a Trans-Neptunian Object before. This means that it was exterior to Neptune, while it is now interior. In a few simulations, Chariklo finds its origin in the inner Solar System, i.e. the Main Belt, which could have favored a cometary activity (when you are closer to the Sun, you are warmer, and your ice may sublimate), which could explain the origin of the rings. But the authors do not seem to privilege this scenario, as it supported by only few simulations. The authors wondered if the rings would have survived a planetary encounter, which could be a way to date them in case of no. But actually it is a yes: they found that the distance of close encounter was large enough with respect to the Hill and Roche limits to not affect the rings. So, this does not preclude an ancient origin for the rings… But a specific study of the dynamics of the rings would be required to address this issue, i.e. how stable are they around Chariklo?